I have discovered something about thankfulness, and it’s this: the more thankful I am, the more thoughtful I am. For many of us, our default isn’t to think about how our life affects others, how our words lift or wound, how our actions impact our “neighbour”. But we’re meant to, it’s how we are created to thrive. We are at our best when we love others as we love ourselves. So how does thankfulness make me more thoughtful? In my life, I have noticed that each time I thank God for being able to walk, I am drawn to pray for those who for the first time will be placed in a wheelchair and never be able to walk unassisted again. When I thank God for my meal, it triggers thoughts of those that have no food, or those who require a feeding tube and don’t get to taste different flavours. Thankfulness is a tremendous trigger for praying for others. It’s a springboard that launches me beyond my selfishness and towards empathy – to care, offer a kind word, or do a good deed. Amazing. Perhaps at the root of selfishness is an ungrateful heart. Perhaps a disregard for what we have breeds contempt and dissatisfaction with this very day God has graced us with. When we are not thankful, we are not fully aware of what we have and we become unaware of the needs of others. Thankfulness and gratitude develop thoughtfulness and compassion for others as we appreciate what we have. I visited a man this week who had a teaching/research position at Macquarie University for 6 years, 20 years at the University of New South Wales, and 4 years at the University of Newcastle. A Senior Lecturer on Earth Science, he travelled the world climbing and studying volcanoes. He was married in 2013 with no diagnosis of MND. Today he cannot move his legs or arms, confined to a wheelchair and is only barely able to talk, quickly losing this gift as well. As I thank God for the slow progression of the disease within my own body, I cannot help but be thoughtful about those who are suffering much worse. When you thank God for what you have in life, it triggers a prayer for those who don’t have and that in turn causes compassion to rise up, insisting we do something about other’s needs. Why don’t you try thanking God for what you have and see where it leads in praying for others? When thanking God for your marriage, it may lead to you pray for your spouse. When thanking God for your children, it may lead you to pray for their future. When thanking God for freedom, it may inspire prayer for those who are in prison simply because of their faith. When we are unaware of what we have, we are also unaware of what others don’t have. I’m not thankful for MND in my body but I try to be thankful in the midst of my MND. Sure there are moments when I grieve what I can no longer do, but I try to keep them to moments and short ones at that, whilst focusing on what I do have and can do. What are you thankful for today and where will it lead you…to thoughtfulness? 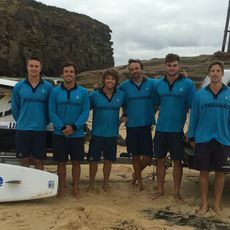 8 of Lake Macquarie’s professional beach lifeguards are setting out to challenge themselves on a 130km board paddle from their own Blacksmiths Beach to Sydney’s Bondi Beach. 100% of the money they raise will be going straight to the MND research and awareness. The 8 Lifeguards that will be paddling are Lucas Samways, Danny Napper, Rory Chapman, Luca Chapman, Rory Tanner, Sam Earp, Jake Ingle, and Troy Ham… legends!! Excellent, Phil. It’s strange to think that a horrible trial, like MND/ALS, would teach us about being truly thankful. Only with God. Bill your one I think about often. Pray you have a good week. Wow – I am thankful for you Phil and the inspiration, courage and wisdom that comes to my inbox each Friday through this blog. Am truly grateful. Thank you. Thanks Jayne. It makes a big difference to me also when I know people are somehow encouraged, so thank YOU. Phil, your posts never fail to speak directly to my heart. Thank you for continuing to share throughout this season, with endless gratitude. Thanks Lacey. Really appreciate your kind words and taking time to read the blog.